[S165] James Savage, A Genealogical Dictionary of the First Settlers of New England, four volumes (Boston: Little, Brown and Company, 1860-1862), III:108-9, entry for Smead; "William, Dorchester, prob. one of the ch. b. in Eng. of wid. Judith Smead, sis. of Israel...He m. 31 Dec. 1658 Eliz. d. of Thomas Lawrence and was freem. 1680, at Northampton, whither he rem. a. 1660, had William; Eliz. b. 20 May 1663; Judith, 18 Feb. 1665; Mehitable, 2 Jan. 1667; Samuel, 27 May 1669; John, 27 Aug. 1671, d. soon; John, again, 1673; Ebenezer, bapt. 9 May 1675; Thankful, 13 May 1677 ; and Waitstill, a d. b. 15 Mar. 1679. He rem. a. 1684 to Deerfielcl, and there d. but the time is not kn. His wid. with sev. of the same name, ch. or gr. ch. 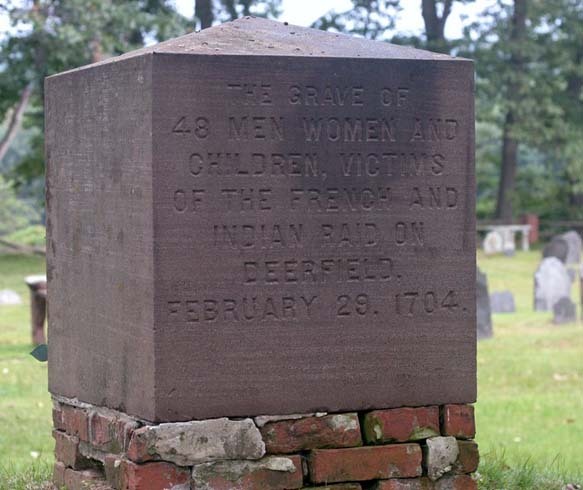 were slain by the French and Ind. 29 Feb. 1704. The first ch. William, b. prob. at D. was k. 18 Sept. 1675, with the flower of Essex under Capt. Lothrop at Bloody Brook ; but Samuel, John, and Ebenezer had fams. at D."
[S1628] FindAGrave.com, online findagrave.com, large standing modern memorial to forty-eight victims of the Deerfield Raid. Narrative: Elizabeth Lawrence, dau. of Thomas Lawrence and Elizabeth Bates, b. Mar 1642, Dorchester, Suffolk Co. MA, d. 29 Feb 1704, Deerfield, Franklin Co. MA; marr. William Smead (1635-1703); children: William Smead III, Elizabeth Smead Janes, Judith Smead Hawks, Mehitable Hull Smead Nims, Samuel Smead, John Smead, John Smead, Ebenezer Smead, Thankful Smead Hawks, and Waitstill Smead Warner.Old Deerfield Burying Ground, Deerfield, Franklin Co. MA. Memorial 32160198, created by and photo added by Kevin Avery. [S813] A Report of the Record Commissioners of the City of Boston Containing Dorchester Births, Marriages, and Deaths to the End of 1825 (Boston: Rockwell and Churchill, 1890), p. 20, Marriages; William Smead and Elizabeth, dau. of widow Lawrence; marr. by Maj. Atherton, 31.10.58 (31 Dec 1658). [S741] George Sheldon, History of Deerfield, Massachusetts, Volume 1 (Greenfield, Mass. : E.A. Hall and Co., 1895), p. 47; first child recorded 1665. [S1024] James Russell Trumbull, History of Northampton Massachusetts From Its Settlement in 1654 (Northampton: Gazette Printing Co., 1898, 1902), two volumes, I:87. The lot was on South Street next to Ralph Hutchison's lot and was granted for ten shillings. [S741] George Sheldon, History of Deerfield I, p. 47. [S1024] James Russell Trumbull, History of Northampton, I:268–269. [S1229] Massachusetts Town and Vital Records: Deerfield 1675–1898, Holbrook Research Institute (Jay and Delene Holbrook), compiler, Provo, UT and Oxford, MA, transcript, p. 182, img 116/481: "Elizabeth Smead, ye wife of William Smead was slain by ye enemy, February ye 29, 1704." This is in the family record of her son Samuel's family. [S762] Thomas W. Baldwin, compiler, Vital Records of Deerfield Massachusetts, to the Year 1850 (Boston: Wright & Potter Printing Company, 1920), p. 312. [S1512] John Williams, The Redeemed Captive Returning to Zion (Boston: Samuel Hall, 1795). Reprinted Springfield, Mass. : H. R. Huntting Co., 1908, pp. 171-172. Hereinafter cited as Redeemed Captive Returning to Zion. [S741] George Sheldon, History of Deerfield I, 308, 309. Has Henry Nims as age 12. He was 22. [S741] George Sheldon, History of Deerfield I, p. 304-05. [S1230] Emma Lewis Coleman, New England Captives Carried to Canada between 1677 and 1760. Two volumes (Portland, Maine: The Southworth Press, 1925). [S813] Report of the Record Commissioners, p. 7, Births 1660; William Smead, son of William Smead, b. 18 (5) [July] 1660. [S289] George Sheldon, History of Deerfield, Massachusetts, Volume 2 (Deerfield: E.A. Hall and Co., 1896), Genealogies p. 301. [S1020] Provo, UT and Oxford, MA, Massachusetts Town and Vital Records: Northampton 1650–1893, unknown repository, unknown repository address, p. 6 in typed version, births in 1664: February 18 [actually 1665 new style] "Jude the daughter of William & Elizabeth Smead born". Hereinafter cited as Mass. Town and Vital Records: Northampton. [S1020] Provo, UT and Oxford, MA, Mass. Town and Vital Records: Northampton: p. 9 in typed version; original [births in 1666] "january 2 Mehitabell Daugh' of William and Elizabeth Smeed was born." [S1020] Provo, UT and Oxford, MA, Mass. Town and Vital Records: Northampton: p. 11 in typed version. [S1020] Provo, UT and Oxford, MA, Mass. Town and Vital Records: Northampton: p. 12 in typed version. [S289] George Sheldon, History of Deerfield II, Genealogies p. 301-02. Ebenezer, son of William Smead and Elizabeth Lawrence, bapt. 9 May 1675.